Hybrid Labs is the third edition of Renewable Futures conference that aims to challenge the future of knowledge creation through art and science. The HYBRID LABS took place from May 30 to June 1, 2018 at Aalto University in Espoo, Finland, in the context of Aalto Festival. Celebrating 50 years of Leonardo journal and community, the HYBRID LABS conference looked back into the history of art and science collaboration, with an intent to reconsider and envision the future of hybrid laboratories – where scientific research and artistic practice meet and interact. We consider the narrative experience as a triangular system of relations between narrative structure , narrative perspective , and physiological manifestations associated with both. The proposal builds on the fundamentally pragmatist idea that no two of these elements are enough to explain each other, but a third is always required to explicate the interpretative angle. 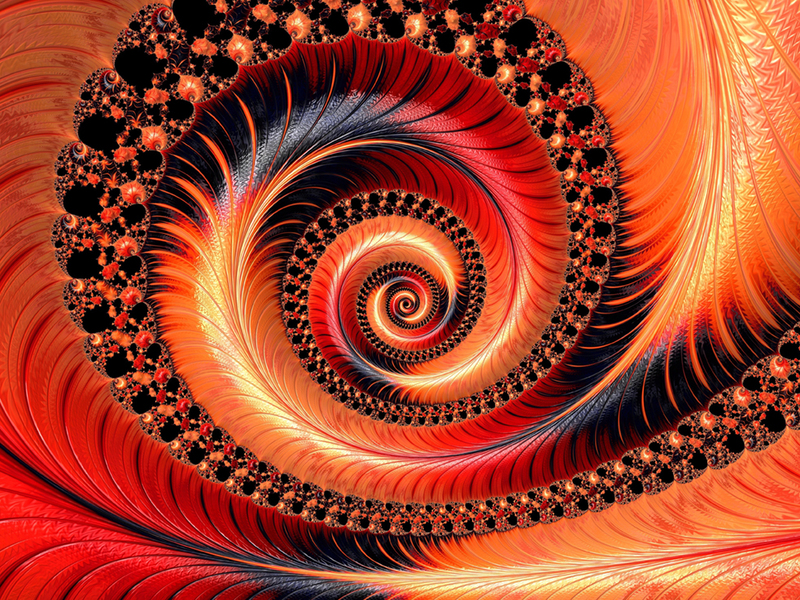 Phenomenological accounts altogether reject the idea of objective descriptions of experience. At the same time, a holistic understanding must assume that a narrative is shared on some level, an assumption narratology must make, and that even individual experiences are also embodied, as is evident to neuroscientists observing brain activity evoked by narrative experience. It cannot be that these accounts are incompatible forever. Using these elements, we discuss a triadic epistemology, a mutually complementary knowledge construction system combining phenomenological, narratological and physiological angles in order to generate integrated knowledge about how different people experience particular narratives. Our approach assumes a holistic, or even deeper, an enactive perspective to experiencing, that is, assuming systemic engagement in the embodied, social, and situational environmental processes. Consequently, we propose understanding narrative content needs to be analyzed not only based on subjective reports of theexperiencer, but they also need to be related to neurophysiological manifestations of the experience. Or, describing the associated neural activity during the viewing of a film is not enough to relate it to subjective reports of the viewers, but the observations also need to be interpreted to conventions of storytelling. A selection of cases are described to clarify the proposed triadic method. my aivoAALTO collaborator professor Mikko Sams showed highlights of neuroscience findings related to viewing films in fMRI and introduced the concept of eFilm, a novel computational platform for producing and easily modifying films to be used in basic and clinical research. 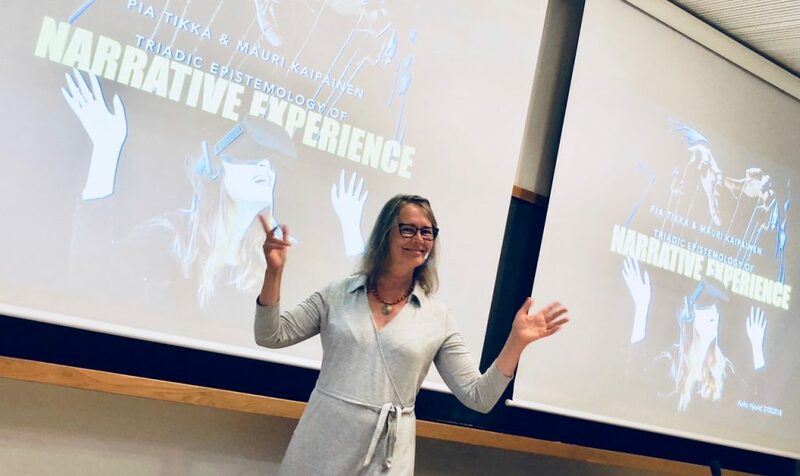 VR Research Talks organised with Virtual Cinema Lab and FiVR Track dedicated on research in and around VR, with a focus on artistic praxes around sound, alternative narrations and the self. Self-reflection is the capacity of humans to exercise introspection and the willingness to learn more about their fundamental nature, purpose, and essence. Between the internal process of Self-reflection to the external observation of one’s reflection – runs a thin line marking the relationship between the private-self and the public-self. From Narcissus’s pond, through reflective surfaces and mirrors, to current day selfies, the concepts of self, body-image and self-awareness have been strongly influenced by the human interaction with physical reflections. In fact, one can say that the evolution of technologies reproducing images of ourselves has played a major role in the evolution of the Self as a construct. With the current wave of Virtual-Reality (VR) technology making its early steps as a consumer product, we set out to explore the new ways in which VR technology may impact our concept of self and self-awareness. ‘Self Study’ aims to critically explore VR as a significant and novel component in the history and tradition of the complex relationship between technology and the Self (—). In collaboration with BeAnotherLab (The Machine to Be Another), Lynda Joy Gerry taught a workshop, “Embodying Creative Expertise in Virtual Reality” to Masters in Interaction Design students at Zürcher Hochschule der Künste (ZhDK), as part of a course, “Ecological perception, embodiment, and behavioral change in immersive design” led by BAL members. Image: Poster for the students’ final project presentation and exhibition. 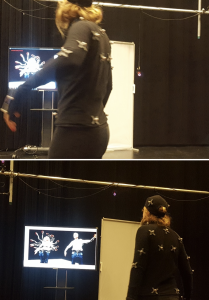 This workshop involved collaborations between psychologists, motion-tracking and capture experts, and theater performers. The performers wore the Perception Neuron motion capture suit within an opti-track system. The data from the performer’s motion was tracked onto virtual avatars in real-time. Specifically, the team had used the Structure Sensor depth-field camera to create photogrammetry scans of members of the lab. 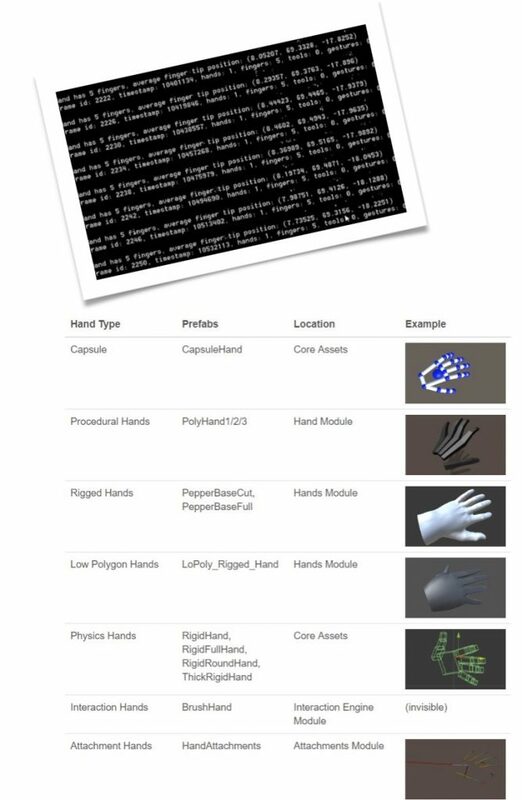 These scans were then used as the avatar “characters” put into the virtual environment to have the mocap actors’ movements tracked onto. 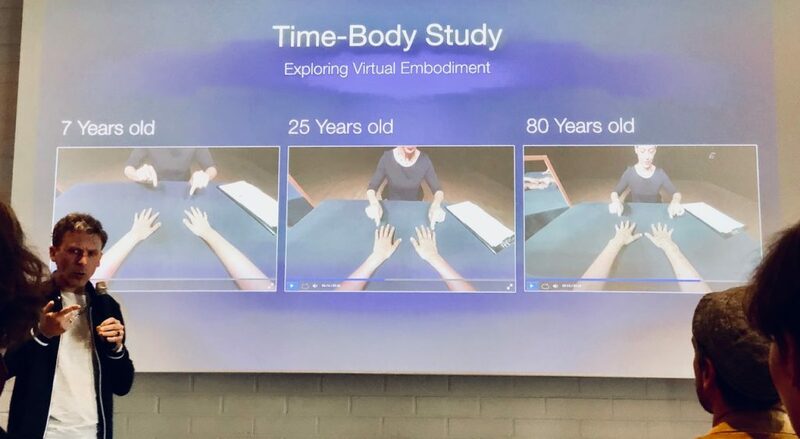 A screen was also programmed into the Unity environment, such that the screen could move around the real world in different angles and three-dimensional planes and show different views and perspectives of the virtual avatar being tracked relative to the human actor’s movements. 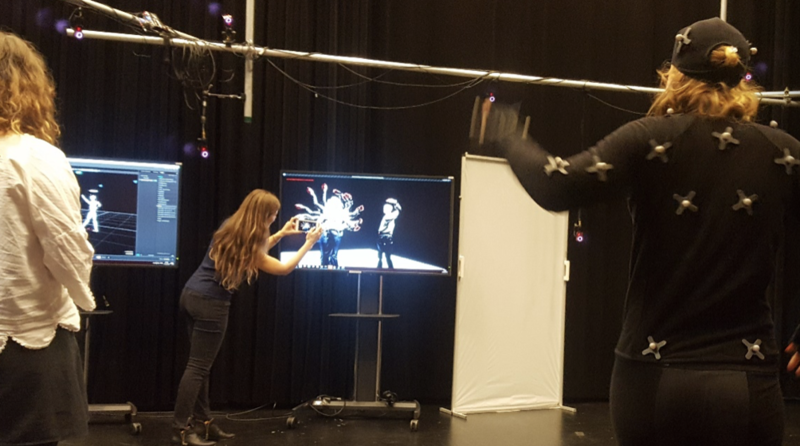 Two actors playfully danced and moved about while impacting virtual effects with their tracked motion – specifically, animating virtual avatars but also cueing different sound effects and experiences. 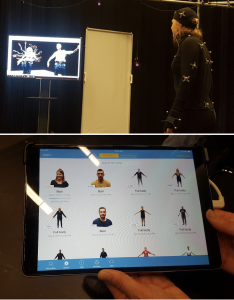 Image above: Motion capture body suit worn by human actor and tracked onto a virtual avatar. Multiple avatar “snap shots” can be taken to create visual effects and pictures. Images below: Creating a many-arm shakti pose with avatar screen captures created through mocap. Image above shows examples of photogrammetry scans taken with the Structure Sensor. 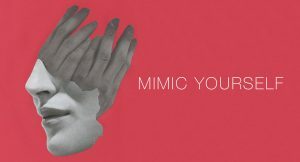 In May the online magazine Lehtiset published a Finnish Language article on “Cinema, storytelling and the mind” by Pia Tikka. On May 17th, Lynda Joy Gerry attended a conference organized by the Berlin School of Mind and Brain entitled “Watch Your Bubble!” The conference title refers to the information bubble conceptualization of social dynamics, wherein which groups of individuals are becoming increasingly nested within a bubble that reinforces only their own worldview. The conference brought in speakers on neuroaesthetics and social neuroscience, specifically Vittorio Gallese, Joerg Fingerhut, Andreas Roepstorpff, Olafur Eliasson, and Vincent Hendricks. Neuroscientist Vittorio Gallese’s lecture specifically explored the ways in which individuals are reciprocally connected and the inter-dependence of self and other. Embodied simulations when imagining actions activate similar neural pathways as actually performing the same action. This makes film an especially evocative medium, specifically for haptic-vision and what Gallese calls “embodying technesis” wherein common action representations exist between imagination and action and also between self and other. The conference also addressed the formation and plasticity of personal identity, where identity comes from and how it is formed. Joerg Fingerhut specifically addressed the types of changes that individuals believe would make them a new person. For instance, a change in one’s musical tastes and preferences is perceived as a change in one’s identity. 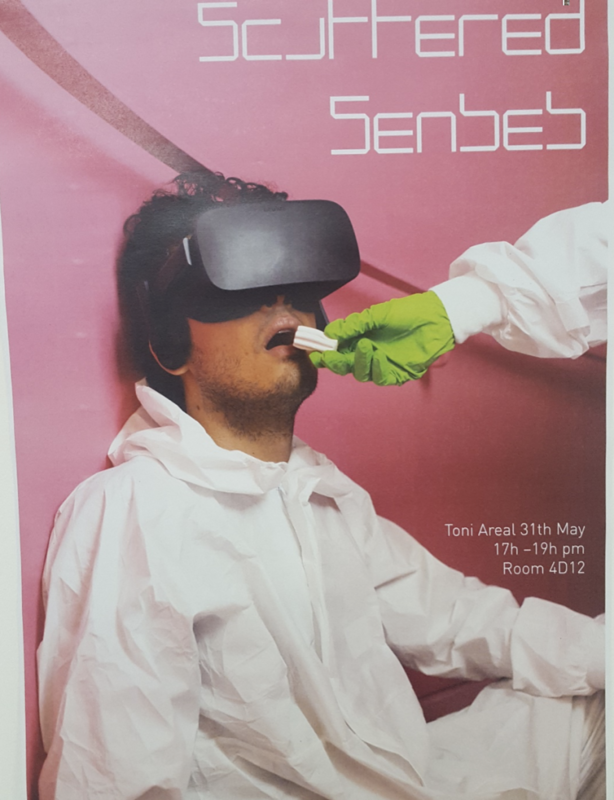 Examination of Johanna Lehto’s MA thesis “Robots and Poetics – Using narrative elements in human-robot interaction” for the Department of Media, programme New Media Design and Production on the 16th of May 2018. As a writer and a designer, Johanna Lehto sets out to reflect upon the phenomenon of human-robot interaction through her own artistic work. To illustrate plot structure and narrative units of the interaction between a robot and human, she reflects upon how Aristotle’s dramatic principles. In her work, she applies Aristotelian drama structure to analyse a human-robot encounter as a dramatic event. 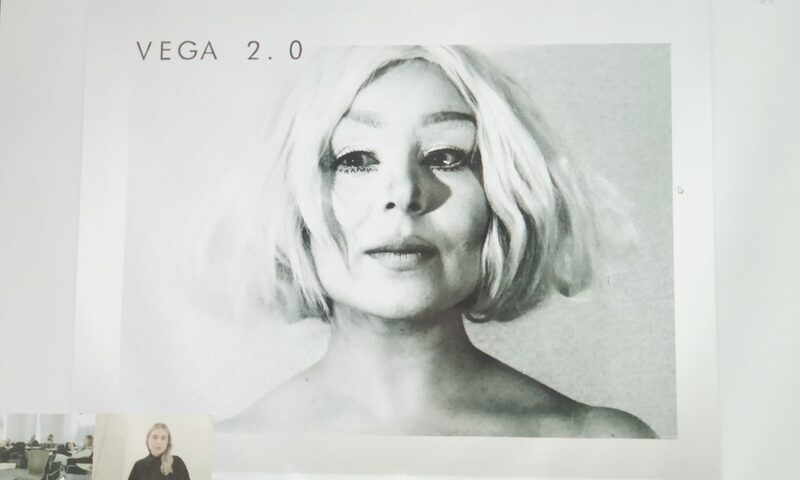 Johanna made an interactive video installation in which she created a presentation of an AI character, Vega 2.0 (image). The installation was exhibited in Tokyo in Hakoniwa-exhibition on 22.-24.6.2017 and in Musashino Art University Open Campus -festival 10.-11.6.2017. Since connected by Storytek Content+Tech Acceleator in fall 2017 Pia Tikka has consulted the VFC project directed by Charles S. Roy on screenplay and audience interaction. Charles S. Roy, Film Producer & Head of Innovation at the production company La Maison de Prod, develops his debut narrative film+interactive project VFC as producer-director. VFC has been selected at the Storytek Content+Tech Accelerator, the Frontières Coproduction Market, the Cannes NEXT Cinema & Transmedia Pitch, the Sheffield Crossover Market, and Cross Video Days in Paris. In the vein of classic portrayals of female anxiety such as Roman Polanski’s REPULSION, Todd Haynes’ SAFE and Jonathan Glazer’s BIRTH, VFC is a primal and immersive psychological drama about fear of music (cinando.com). Its main innovation is in bringing brain-computer interface storytelling to the big screen by offering an interactive neurotech experience. On the premises of the Cannes Film Market, as a grant holder for the Estonian innovation and development incubator Storytek Accelerator, Charles presented his work to the audience of the tech-focused NEXT section (8-13 May).